Lieutenant (Lt) Barney has had an outstanding tour of duty as a subaltern in the Regiment. He has delivered on two operations, looked after his soldiers immaculately, and has invested significant time and effort into the role of Battalion heritage officer. In doing so, he has considerably enhanced the name of the RGR, not only externally but also within the First Battalion, educating all ranks on nuances and detail of our history and traditions. Lt Barney was a Training Team Commander for the British and Irish deployment to Mali (Operation NEWCOMBE 6B) in support of the Malian Armed Forces. Operating in an uncertain and austere environment, Lt Barney took every opportunity to conduct Defence Engagement and enhance the Gurkha name wherever possible. He was also the UK lead for English language training for the West African Officers’ Course. In an environment where working with other nationalities was routine, tact, diplomacy and patience were often as important as his professionalism. Lt Barney displayed these qualities in abundance, and ensured that the reputation of the RGR as professional soldiers and invaluable partners was maintained. He directly affected the lives of Nepali communities through his hard work and industry in the immediate aftermath of the earthquakes in Nepal. At the end of his Nepali language course, he volunteered to remain in Nepal to assist with disaster relief. He was engaged as the Operations Officer to the Second Battalion’s contingent, conducting humanitarian assistance and disaster relief operations. Notably, he supported Shelter Box, a charity dedicated to providing shelter kits to the homeless. His efficiency, imagination and ability to get along with people from all walks of life led to Op MADAT KUKRI. He meticulously planned and executed this involving, local authorities, Nepalese Army, Shelterbox, local contractors, BBC Radio and the local population. His maturity, calmness under pressure and ability to harness the efforts of such a diverse group was remarkable for such a junior officer. 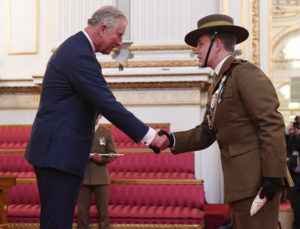 He has done more than any other officer or soldier in the First Battalion to bring our Regimental history to the attention of serving officers and soldiers. His imaginative presentation, attention to detail and the high quality of his output has instilled in all ranks pride and purposefulness that is difficult to measure but easy to feel. His work has enhanced both the Battalion’s sense of its own rich history, and invigorated its relations with numerous affiliated associations. One example of Lt Barney’s efforts to bring Regimental history to life of many is the excellent memorial to General Sir Francis Tuker, now displayed outside the Guard Room in Tuker Lines. Lt Barney is the epitome of a modern Gurkha Officer; committed to upholding our unique heritage in every way he can, caring for his soldiers, an excellent ambassador for the Regiment, and highly effective on operations. His energy, engagement, professionalism and operational performance, and his work to enhance the name of the RGR both inside and outside the Regiment demands recognition. 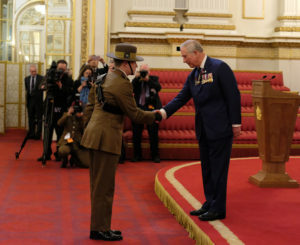 He received his award from HRH Prince Charles (Colonel in chief – Royal Gurkha Rifles) inside Buckingham Palace on 14th March 2017.